While at MIT, Grace worked at Coca-Cola, IBM, and Bain. She then worked at Sports Illustrated in NYC and for Time Inc. in Hong Kong. 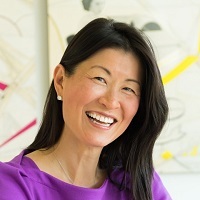 After HBS, she worked for Fortune 500 brand leaders General Mills and Clorox and was then recruited into the tech startup world, where she led product management, business development and then served as head of marketing at the last 3. 1 IPO and 4 nine-figure exits.She then founded her own firm, which rebranded last year from Savvy Marketing Group to Savvy Growth, offering management consulting and executive coaching services in addition to marketing strategy advisory. From her early journalism days back in NYC where she did business writing and started the publication The New Asian Times, Grace has continued to serve in the last decade as a correspondent for N&O and Triangle Business Journal writing on leadership, doing business in China, and her favorite subject: the correlation between those who start successful companies and those who train for endurance events and those who climb the 7 Summits….which was the topic of her TED talk last year. Grace speaks around the world and has served on adjunct faculty teaching entrepreneurial marketing and innovation at UNC Kenan-Flagler as well as at Fudan in Shanghai in joint venture with MIT Sloan School.